Cape Town - Alan Pardew picked up a point in his first game in charge of West Bromwich Albion, against former side Crystal Palace as their Premier League clash ended goalless. Palace were impressive from the off from a side struggling for form and goals, but it was Hal Robson-Kanu with the first chance, and miss of the game, on eight minutes, after picking up a good cross from the left from Kieran Gibbs. Salomon Rondon then fired straight at Julian Speroni before Jay Rodriguez headed a Gareth Barry free-kick just wide. Ben Foster made a good stop at his near post to deny Wilfried Zaha as Ahmed Hegazi headed into the side netting as both sides looked to break the deadlock. Zaha was denied a penalty on 18 minutes after being brought down by Foster in the box ahead of a near-post shot from Rodriguez that was well blocked. Zaha saw a 22nd minute shot deflected over the bar by Johnny Evans, while West Brom suffered a blow as Barry had to be withdrawn with an injury, and was replaced by Claudio Yacob. Christian Benteke beat four Baggies' defender before Foster raced out to smother the ball while the last real piece of action at the end of the first half saw the striker head a 42nd minute corner wide before heading into the arms of Foster from a second set-peice delivery. Joal Ward was well placed to block a Sam Field volley at the start of the second period before a second unanswered penalty shout from the hosts. West Brom had Evans to thank for a vital interception to stop Benteke from stroking home on 55 minutes before Rodriguez was denied by Speroni at the other end. Both sides continued to press in search of the opening goal, and Rondon came close on 63 minutes after being played through down the right-hand side, only for Speroni to get fingertips to his strike. Field was on hand for the rebound, but couldn't direct his effort on target. Robson-Kanu would have done well to beat Speroni from a tight angle on 70 minutes before Ruben Loftus-Cheek played in a dangerous ball across the face of the Baggies defence. Both sides appeared to be content with a point with the game winding down, although Allan Nyom so nearly set up Rondon for the game's opening goal, only for the striker to head inches past the left-hand post. 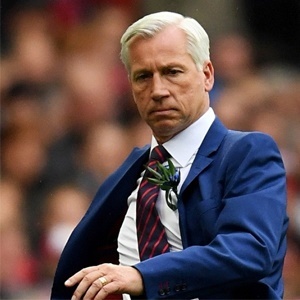 Ultimately, Alan Pardew’s first game in charge of West Brom saw him claim a point against his former side.